America's #1 Tech Job Board! Need to quickly fill technical positions? Our site is highly targeted toward technology professionals, our jobs get distributed through a vast network of job boards and feeds. AceTiger is one of the most popular tech job boards and is used by over 5,000 employers (including many Fortune 500 companies). Vast distribution network means your tech job shows up on a multitude of other websites, job aggregator sites and blogs. Plus we have a daily EMAIL (job alert) that goes out to thousands of registered users! How is AceTiger better than Monster / Careerbuilder? While me might not equal Monster's traffic, we get a whole lot of visitors and have nationwide reach. We get thousands of visitors daily, from all corners of the United States. And these visitors are not annoyed by ads all over the place, or a slow loading site. They also convert to job applicants at a higher rate and, on average, fit the job better. - Monster/Careerbuilder are overloaded with graphics and various other content, which results in slow loading times. Our site is optimized and loads fast! Monster and Careerbuilder have annoying ads all over the place. We have very little advertising. How is AceTiger better than Craigslist? with AceTiger, you can create a company page and post jobs under this company. Want exposure for your jobs? Get followers! Non-confidential jobs have a [follow] link. Your followers are automatically be notified of all new jobs. AceTiger includes a Free applicant tracking system and a myriad of other features that make recruiting and hiring a breeze! 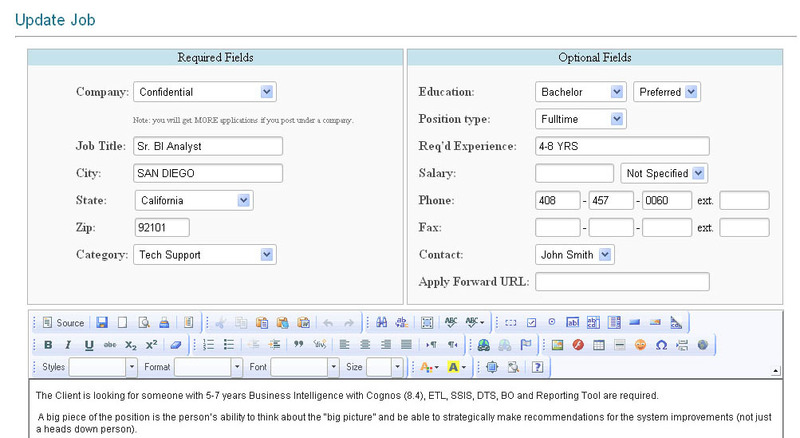 Offers exposure to millions of job seekers through job feeds into job aggregation websites. AceTiger has been instrumental in our tech recruiting efforts. It brings us the tech talent better than any other resource out there. And, believe me, we've tried quite a few. In this economy, it is difficult to justify spending thousands of dollars on 5-10 ads with Monster® or Careerbuilder® with limited results, and that's why AceTiger has been invaluable to me by bringing in a lot of strong, qualified candidates for each of the jobs I've posted.